Senate Minority Leader Mitch McConnell has promised to filibuster new gun control legislation, putting up a significant roadblock to Democratic efforts to move forward on the measure this week. “While nobody knows yet what Senator Reid’s plan is for the gun bill, if he chooses to file cloture on the motion to proceed to the Reid Bill (S. 649), Senator McConnell will oppose cloture on proceeding to that bill,” McConnell spokesman Brian McGuire told RedState. McConnell is now the 15th Senator to sign on to the Republican gun control filibuster, an effort that has been spearheaded by conservative Sens. Rand Paul (R-Ky.), Ted Cruz (R-Texas), and Mike Lee (R-Utah). As the top Senate Republican, McConnell’s support gives the filibuster a much higher chance of success, imperiling the already-delicate bipartisan negotiations on new gun control measures. McConnell’s promise to filibuster also deflates criticism from the more moderate wing of the GOP. During an appearance on CBS’s Face The Nation Sunday, Sen. John McCain (R-Ariz.) seemed bewildered by the idea of the filibuster, and called on Republicans to allow debate over the bill. 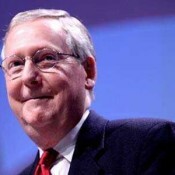 Post Continues: Mitch McConnell To Filibuster Gun Control – Business Insider.